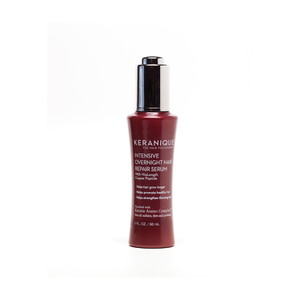 Keranique Replenishing Keratin Conditioner is a weightless, nutrient-rich formula that delivers the substantive conditioning found in a mask, during the course of a two minute application. It penetrates and hydrates even the driest hair types to transform coarse, dull and/or damaged hair into soft, smooth fiber. It protects both the cuticle and the keratin fiber. It renews softness, shine and manageability and helps prevent future damage. It imparts strength; repairs split ends, smooth the cuticle and improve fiber quality. A restorative daily conditioner that renews softness, shine and manageability, improving the look, feel, and behavior of dry or damaged thin hair. 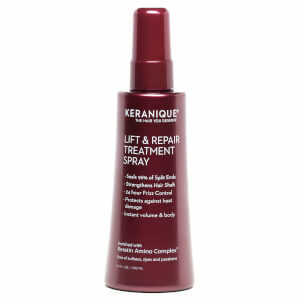 This conditioner helps to moisturize thinning hair without weighing it down. This is a non-residue formula that will not leave a waxy build-up on hair. 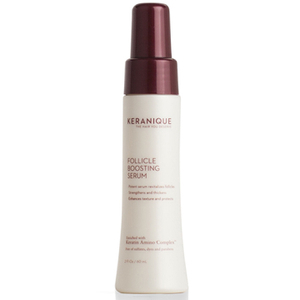 Our proprietary Keratin Amino Complex creates a shield that protects against environmental damage. Water (Aqua), Cetearyl Alcohol, Cetyl Alcohol, Behentrimonium Chloride, Isododecane, Hydrolyzed Vegetable Protein PG-Propyl Silanetriol, Amodimethicone, Glycerin, Caprylic/Capric Triglyceride, Linoleamidopropyl PG-Dimonium Chloride Phosphate Dimethicone, Behentrimonium Methosulfate, Zea Mays (Corn) Starch, Hydrolyzed Keratin, Keratin, Arginine, Acetyl Tyrosine, Allantoin, Biotin, Bisabolol, Niacinamide, Calcium Pantothenate, Ornithine HCl, Citrulline, Glucosamine HCl, Panax Ginseng Root Extract, Ceratonia Siliqua (Carob) Fruit Extract, Curcuma Longa (Turmeric) Root Extract, Arctium Majus Root Extract, Apium Graveolens(Celery) Seed Extract, Panthenol, Tocopheryl Acetate, Hydrolyzed Soy Protein, Methoxy PEG/PPG-7/3 Aminopropyl Dimethicone, Quaternium-72, Quaternium-91, PPG-3 Benzyl Ether Myristate, Zinc Gluconate, Polyquaternium-7, Cetrimonium Chloride, Polyquaternium-11, Stearamine Oxide, Zinc Pyrithione, PEG-12 Dimethicone, Fragrance (Parfum), Hydroxyethylcellulose, Guar Hydroxypropyltrimonium Chloride, Isopropyl Alcohol, Citric Acid, Disodium EDTA, Chlorphenesin, Potassium Sorbate, Benzyl Alcohol, Phenoxyethanol.